This is Brin once again. Sorry for the long wait, but this has been a hard blog to write. Currently, I am sitting in the Nairobi, Kenya airport on a layover, waiting to board my flight to Bombay, India. If you’re wondering why I’m not staying in Uganda, we might be in the same boat. Deep down inside, I really, really wanted to stay, but alas, my reason for leaving is simple. While in Uganda visiting the SOUP site, I was also researching a small niche of Econ Development, which you can read about further in my other blog. I am traveling in Europe, Africa and Asia on a grant funding by my university (Berry College). Enough of that boring intro, it’s time for me to explain the purpose of this blog entry. Two blog entries ago I explained the severity of health problems in Isiti, Uganda. The lack of medical care given to people is simply astonishing. 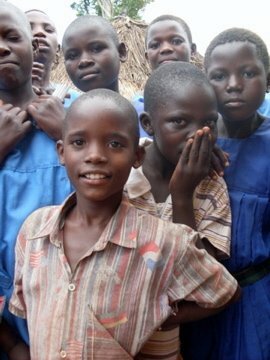 The average family in Uganda has 8 children. However, in the village that number is sometimes double. Can you imagine? That’s a lot of sharing. Family planning is important, but never truly stressed. Therefore, children are not given proper medical treatment (among other things) due to lack of finances. In that blog I explained my reaction when I saw a girl with an untreated bacteria above her ear. I vowed to purchase ointment for the girl to prevent her from undergoing any type of social stigma for having such a visible problem. Then, a teacher explained that every child in the village drank well water and therefore had worms. Appalled by this realization, the SOUP will now provide tablets for each child to eradicate the worms. But more importantly, Sarah Thomas (SOUP-Staff member) will gather the women of the village for a day of training. She will teach them basic ways to prevent worms, like boiling the water for instance. She’s also planning other things, but I’ll let her explain later. This is where I really want to STOP writing… but I will continue. The second day I went to the village, Sarah joined me. We spent the morning playing with the kids, eating lunch, talking with the teachers, and interviewing old students. A pretty perfect day. As we were about to wrap up our day I saw a little boy limping away from school. I called him over and saw a wound on his left leg. Without hesitating I brought him into a private room and asked a teacher to join me. “My name… it is Adam,” said the little guy. The teacher explained to me that Adam broke his left leg 5 years ago and the village doctor fixed it. But, my friends, it was not fixed. It was healed, but it was not corrected. He walked very differently than his peers, especially considering the difference in length between the two legs. But this actually wasn’t my main concern. He also had a very large and infected wound on the back of this very leg. He looked at me and responded very clearly, “Yes.” He tripped in January (probably due to the previous injury), and injured himself. The wound was never treated. It is now June and an infection clearly exists where the wound first occurred. This is NOT OKAY. Immediately I asked the headmaster to call every injured child in the area to meet with me. About 15 out of our 242 students came forward, but they were mostly in pain from topical and very treatable wounds. Except for one. Ronald. Without thinking twice I responded, “We’re taking Ronald and Adam today. Right now. Let’s go.” Sarah nodded her head in agreement and after Michael spoke with the parents we were off. We arrived, after an hour's drive, to a private doctor, where I was treated for Malaria 2 years ago. We went back to the operating room and the Doctor poured alcohol onto his wound and scrubbed the infection. I held Adam as the doctor scrubbed. He screamed and squeezed my hand; his little African arms beat the table as big tears fell from his little face. I lay beside him and cried silently as I prayed. Finally, the doctor finished scrubbing and gave him an injection to kill the infection. After everything, my strong little Adam wiped his face as I carried him to another room. Ronald was next. If the infection in his knee had grown any larger the doctor would have required amputation. However, Dr. Musa took Ronald into surgery almost immediately. I sat through the surgery, which is a normal for mothers in Uganda. J It was disgusting, but everything went well. It was not cancer, but rather a really imbedded and really infected internal wound. Post-surgery I brought them both ice cream and watched them smile as they devoured ever drop. I would also like to mention that Sarah Thomas was a champ throughout this entire time. AND the girl is a praying machine. She has stamina. We ended up paying for everything on the spot as well as purchasing prescriptions and further injections for the weeks to come. To prevent this from every happening again I made an agreement with Michael and the SOUP teachers. If a child is EVER suffering or even sick, provide treatment for that child immediately. These kids were suffering from preventable pain; if treated earlier it would have never been an issue. I ended up meeting three American med students from the Universities of Florida and Ohio who are currently interning in Uganda. I have coordinated with them to visit our school as soon as possible and do physicals on every child over a 2 day period. Also, a wonderful woman and her daughter have offered to provide mosquito nets for each child at our school. That is 242 mosquito nets. Pretty rad. We purchased medical supplies and will continue to treat Ronald and Adam until they are completely healed. Each child, regardless of color, background, parental situation or whatnot shall not suffer. The SOUP has big BIG plans for this village. More than just fixing all our babies, first and foremost, we will make each and every one of them well. Some SOUPer Babies Need Our Help! School Picture Day... in UGANDA! What does a school in Uganda look like?